Some petroleum distributors are grumbling about getting only 50 percent of demand after Vietnam’s biggest refinery halted production early 2019. They are saying that the shortage, which has lasted nearly two weeks now, is a result of the Nghi Son Refinery experiencing technical issues and temporarily stopping production earlier this year. On Tuesday, many petrol stations belonging to the Military Petroleum Corporation began hanging signs saying they are no longer selling RON95, one of the two main types of petrol used in Vietnam. The stations now pump E5 RON92 instead, a variant that contains biofuel. "We have run out of RON95 since March 22," said a representative of one of the petrol stations who did not want to be named. "Many customers, especially car drivers, want this type of petrol but we don’t have it," she told VnExpress. The shortage has also resulted in a sharp decline in revenues, she added. 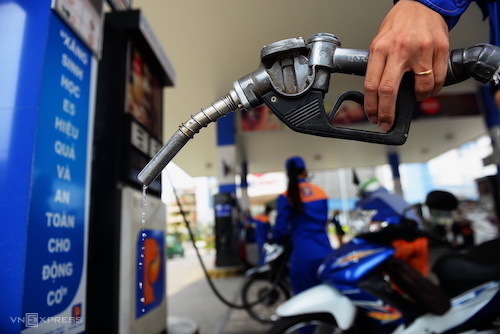 The owner of a chain of petrol stations in Hanoi’s Thuong Tin District said they have been having trouble getting the RON95 petrol from distributors over the last 10 days. "I have had to call 3 to 4 traders a day just to get enough to sell for the next day," he said. Down south, the owner of a business in HCMC also said that he had been placing increasing orders of RON95, but distributors were unable to meet them. After the Nghi Son refinery closed, distributors had to source more from Dung Quat, Vietnam’s only other refinery, in order to maintain supply, and import the rest. However, Dung Quat only supplies 40 percent of the domestic market, while the supply of imported petrol, mainly from South Korea, was also unstable with several refineries halting production for maintenance at this time of the year. Nguyen Van Tiu, director of a petroleum company in the northern province of Hoa Binh, said that the gross margin for RON95 had fallen from VND1,000 (4.3 cents) per litre to only VND450 (1.9 cents) this year. With such minimal profit, some distributors cannot even cover the cost of imports, he said. A petroleum industry expert said that because distributors are required to set up large provisional funds based on the amount of petrol they import/sell, businesses deliberately limit their supply. The leader of a major petroleum distributor in the south confirmed that his company’s price stabilization fund was VND300 million ($12,944) in debit, so they had to use company capital to make up the difference. It has been importing at high prices and selling them at capped prices, he said. Another executive of a petroleum company in the south also commented that businesses can only source petrol from South Korea at the moment, given its 10 percent tax rate (due to a free-trade agreement). "The state has to calculate carefully. Relying on South Korea while domestic production is unstable will be very risky for the domestic market," he said. While businesses are worried about the ongoing shortage, the Ministry of Industry and Trade has maintained in a statement that "supply is still sufficient". In case of shortage, enterprises will seek reasonable import sources to ensure sufficient supply for the domestic market, the ministry has said. "Enterprises are committed to ensuring continuous and uninterrupted supply for the petroleum distribution system," the ministry said. Vietnam imported 1.09 million tonnes of fuel worth $616 million in the first 2 months of this year, down 50.5 percent in volume and 56.7 percent in value from the same time last year, according to the General Statistics Office.